The majority of contaminated sites in the UK contain impacted groundwater that requires treatment during remedial works. Groundwater can be abstracted from open excavations, boreholes, trenches, eductor and ejector wells, or even cut off trenches and pumped to a water treatment facility where contaminants are removed from the water. Clean water can then either be discharged to a trade effluent sewer, recycled for use on site such as dust suppression or re-injected back into the site with appropriate approvals. 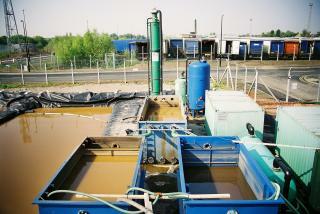 Groundwater treatment is usually combined with other remediation processes such as dual (multi) phase extraction , ex-situ bioremediation or excavate and dispose. Additionally many remediation processes produce liquid waste streams that require water treatment such as leachate from ex-situ bioremediation or abstracted effluent from dual phase systems. A pump and treat approach can also be used as a treatment system in its own right should the site have other constraints limiting remediation options or if the site and client requires a longer timescale remediation. 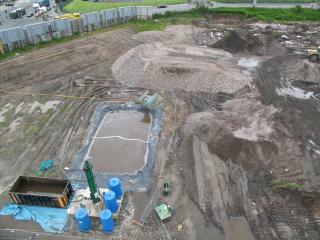 The majority of VertaseFLI remediation works have involved water treatment of groundwater plumes and/or dewatering of excavations. Due to these requirements VertaseFLI designs its own modular water treatment plants (WTP) so all of our treatment plants are adaptable to almost any contaminant. VertaseFLI was commissioned to design and construct a WTP capable of treating water from a VertaseFLI designed dual (multi) phase extraction system and water from civil engineering excavations. The water treatment plant ran on site for 6 months, during which time the plant was successfully increased in capacity to accommodate additional excavation works. The plant consisted of a number of units including a settlement tanks, oil/water separator, GAC units, pumps and hosing, the unit was fully automated and ran successfully for the duration of the project. Treated water was discharged under a trade effluent license to a local waterway under a stringent discharge consent, which included weekly laboratory analysis of treated waters. In total over 3.2m litres of groundwater was treated and 1,000 litres of free product was collected.